Our popular half day tour. Explore the rural hinterland and the villages and get away from touristy Hoi An. We zoom out of Hoi An to explore the Thu Bon River Delta hinterland. We traverse irrigation channels, dyke walls and country laneways, all the while, soaking up the landscape and the local way of life. 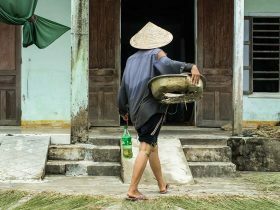 We stop for drinks at small, family-run cafés, experiencing the everyday routine of the rural Vietnamese folk. On the return trip, we ride the unique “floating bridge” lane route, “high 5” with local kids and enjoy picturesque views of the sunset as it fades behind the mountains. This is a dream tour for amateur and professional photographers alike. We can also run this tour in the morning. 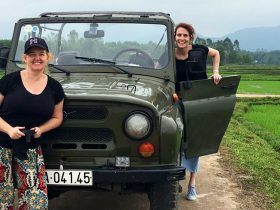 JEEP TOURS takes a different, though similar route though cannot visit the floating bridges or irrigations channels because the Jeep is too big. You will still see plenty of cool stuff. Airport Pick Up - 4 seat car: 460,000 VND (20 USD), 7 seat car: 575,000 VND (25 USD), Minivan: 690,000 VND (30 USD) Half Day Private Tour: 690,000 VND (30 USD) / day / group Please leave this field empty. 1,150,000 VND (50 USD) per person going by motorbike. 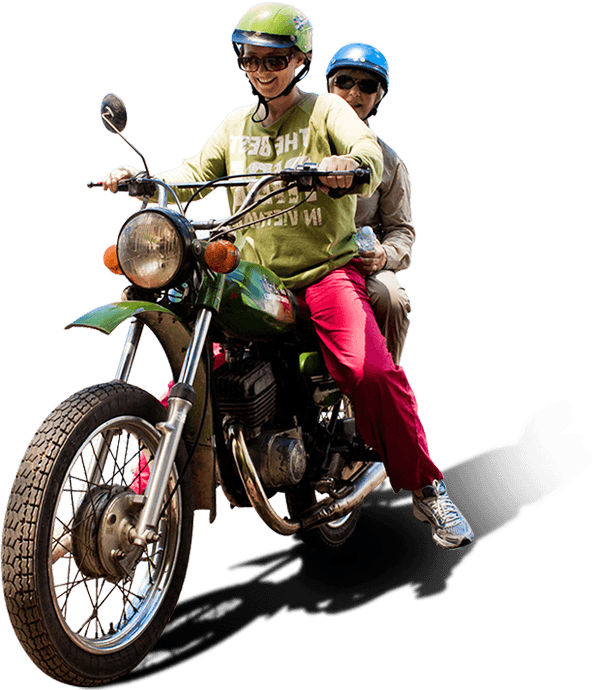 – You can either ride yourself or sit on the back with one of our experienced drivers. If there are two of you, it’s only 575,000 VND (25 USD) for the pillion passenger, if you share one bike. * Please note, we do not offer a pillion discount for tours departing with only 2 people. 1,840,000 VND (80 USD) per person travelling by Jeep. 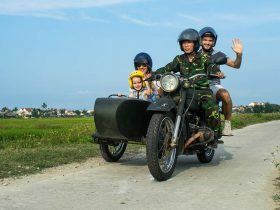 My family & I (Wife, kids 8, 7 & 6 yrs) took the half day motorbike tour around Hoi An and can only recommend it to anyone else that wants something different from the ‘minibus and walk’ that seems standard in the area. Each of the kids had their own rider, very friendly (encouraging the liberal use of the horn and thus fitting right in with the locals!) and safe while we rode our own scooter. Nothing too much trouble and safety first all the time (unusual for Vietnam). After 20 mins riding we are out among the local villages, not a tourist to be seen. This bike tour a must do before 21st century takes over and we lose the beautiful landscapes and bamboo bridges being demolished for concrete. I did the half day tour and got to see parts of the countryside I would never have been able to visit on my own. Plus, seeing all the smiling kids rushing out to high-5 us was really cool.